Phil Bartie, who was a researcher on William Mackness’s paper delved deeper into the issue of Landmarks. He was using images to find out what people identified as landmarks and was analysing them semantically and spatially to distinguish related and unrelated features. His use of Trigrams, or groups of three words may well be a solution to issues with obtaining good searchÂ results from EDINA’s place name gazetteer. Spatial Analysis:Â the best 2 talks being really quite different. Georgios Maniatis discussed error quantification and constraints in environmental sensors. Â Georgios’ was looking at sediment movement in rivers, using a local reference frame offered accuracy improvements but added further complications, not least that a significant portion of the signal travel time was through water. Given the small distance from transmitter to receiver, errors could quickly become significant. Citizen Survey: This session looked really interesting and Neil Harris (Newcastle Uni) kicked off with a very interesting description of a heterogeneous sensor infrastructure which used a schemaless approach. Â They had effectively decided to avoid XML and used key value pairs instead. Â By using HStore they were able to hook things up with Postgres/PostGIS. The advantage of this approach was that they could integrate new sensors into the D’base easily by just adding key values to the main list. Key values may be seen as old hat by many, but with HStore it gives quite a flexible solution. The work is part of the Science Central project and will effectively pulls together all possible data feeds for the Â Science CentralÂ to use. The other presentation of note was by Robin Lovelace (Leeds) who invited discussion around the merits of twitter data in research. Â This was not about the ethics around whether users knew what data they were giving-up, but more about the pro’s and con’s of using the data at all. As the discussion progressed it was mentioned that we may be in a golden age for social data, at the moment lots of people are providing information through social media and the social media companies like twitter are allowing us to use the info for free. At some point either the public will realise what info they are providing and seek to limit it, or the government will perhaps do so, and social media companies (who trade on information about users) may restrict access to data or try to charge for it. Â Interesting and thought provoking. Â If you want to find out more, look at Robin’s presentation and download his code from Twitter to set up a Twitter Listener. Remote Sensing – I used to do remote sensing so i thought i would go to this session and see what was new. It turns out that it didnt have a huge amount of remote sensing in it, but there was a couple of gems worth mentioning. First is the work that Jonny Huck (University of Lancashire) is doing with sensors. Â Jonny presented Map.me at last years GISRUK and it was good to see this being used in other people’s research, but the sensor work took a different direction. Jonny made a low-cost (Â£400) pollution monitoring kit that also monitored VO2 flux of users. This allowed him to crudely calculate risk of pollution. Â It was simple kit using motes , smart phones and some basic gis for visualisation. I found it quite refreshing to see a simple approach taking off the shelf kit and running simple experiments. This will hopefully lead to discussion, refinement and some really insightful science. The other presentation that i enjoyed introduced Whitebox – a geospatial analysis toolkit created by John Lindsay. This is an open-source GIS package and i was stunned by how many tools it had., over 370 at the last count! Possibly most impressive was the Lidar processing tool which will happily open 16Gb of raw lidar point cloud and allow you to process it. I dont know of another open source package which handles lidar. Â John likes to call Whitebox open-access rather than open-source. Whats the difference? Well when you open a module there is a “View Code” button. This will open the code that runs the module so that you can see how it works and what it does. Whitebox is relatively unknown, but John hopes to push it more and the audience suggested using GitHub rather than google code repository and to work towards OSGeo incubation. Â It does look good and i have already downloaded it. Oh, it is a Java app so is easy to get working on any platform. Overall – the conference was well received and i found some of the talks really interesting. Â I would have like to be inspired by a keynote at the plenary and I hope that GISRUK 2015 in Leeds will use the plenary to motivate the group to continue to do great GIS research. Thanks to the Â local team for pulling the event together, it is never an easy task. Â You even managed to get the weather sorted. Following on from successful meetings In England and Wales, on 19th March I attended the inaugural “Scottish QGIS User Group” hosted at Stirling University. My first thought revolved aroundÂ the level of interest that such a meeting would acquire, but as it turned out, it was very popular. I was also surprised at the geographical spread of the attendees, with several folks coming from Brighton (Lutra Consulting) andÂ Southampton (Ordnance Survey) as well as all over Scotland & northern England. Although the attendees were dominated by public sector organisations. From my own perspective, the talks on developing QGIS and Cartography in QGIS were of particular interest â€“ demonstrating the every growing potential of QGIS. Additionally, the improvements (particularly speed enhancements) Â that look to be coming soon (as highlighted in Martin Dobias’ presentation) are impressive. A special mention of thanks needs to go out to Ross McDonaldÂ – @mixedbredieÂ (Angus Council) for his efforts to organise the event and additionally thinkWhere (formally Forth Valley GIS) for sponsoring the event. Flight-370 disappeared on the 8th of March 2014 having left Kuala Lumpur en-route for Beijing. There was simply no trace of it. Communications were lost somewhere over the Gulf of Thailand. Speculation quickly rose as to the fate of the aircraft with hijack and rouge pilots being muted as possible explanations. Â A catastrophic break-up of the aircraft through an explosion was not ruled out but looked unlikely as this would generally be noticed. Furthermore, there was no sign of debris in the area of Flight 370 last known position. After a few days, data started turning up that suggested that the plane had stayed aloft for several hours after all communication was lost. Â Equipment onboard transmits information such as status updates and diagnostics. Â The engineering teams can then monitor the health and performance of components while they are in use. The engines had sent burst of data every hour and these had been picked up by a satellite operated byÂ Inmarsat. By monitoring the Doppler effect in the received data, Inmarsat was able to chart 2 possible paths; one to the north and the other to the south. Â This had never been done before and the innovative use of this data by Inmarsat allowed the rescue effort to be concentrated in 2 distinct areas. After a bit of tweaking and refining, the InmarsatÂ scientists were able to discount the Northern corridor and the search re-focused on the Southern corridor, a vast expanse of ocean west of Australia with no suitable landing site. Â How they achieved this was really quite clever. They used “truthing data” from other aircraft to monitor the Doppler effect and therefore refine their estimates for Flight 370. They then calculated the speed and altitude of the aircraft and were able to work out roughly where it would have run out of fuel and ditched into the ocean. Â This greatly reduced the search area. Australian AP-3C Orion – Orion aircraft were deployed to likely search areas and scanned the area. Â It is likely that the crew were using a combination of electronic surveillance systemÂ and just their eyes. This might seem like old-school, but it is an effective method of verification as trained operators can discount or confirm sightings from remote sensing. The aircraft has a long-range and can fly low making it ideal for searching. Why has it taken so long to refine the search area? Â Well there are lots of satellites, but only a few of them would have had suitable sensors on-board. Data is collected and beamed back to a receiving centre. The raw data will most probably have to be processed before it can be used for anything. Â This takes time. Â The search area may well have been narrowed to a chunk of the southern Indian Ocean, but this still represents a huge area, not dissimilar to the size of Western Europe. Â Processing and analysing data for such a large area is not easy and will rely on a degree of automation followed by humba verification. Then you add in the ocean currents. Â Anything object floating in the ocean will not be static and could drift by 10′s of kilometres a day. 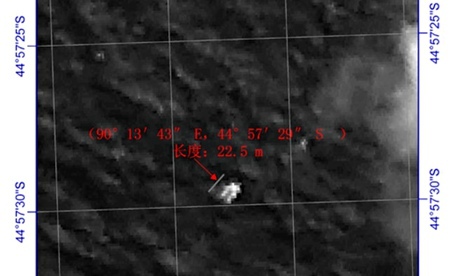 Given that the plane is likely to have crashed 15 days previously, debris could be 100′s of kilometers from the crash site. That is, if it has not already broken up and sunk. Â But we can at least model the ocean currents and estimate the potential dispersal of the debris. Â The NY Times have some excellent visualisations of both the currents and the wave heights in the southern Indian Ocean during March. Â These have been produced by theÂ National Oceanic and Atmospheric Administration and the National Centers for Environmental Prediction through remote sensing data, in-situ data (buoys) and models. Â While never 100% accurate, they provide an indication and convey the uncertainty involved in determining a search area. Once a search area has been identified, the searchers are able to deploy listening devices which locate “pings” emitted by Flight 370′s black box. This is achieved by towing a listening device (TLP-25) back and forth across a wide area. Â Pings should be received periodically and the position and strength of these should triangulate the position of the black box. But the sea floor is not flat in this area. It is around 4500m deep with mountains up to 2500m high. Â We actually know very little about remote ocean sea beds. Â We have limited data collected by ships and most representations come from spaceborne remote sensing data. These are not very accurate and may “miss” large structures (1-2km high) such as seamounts. There is nice overview of ocean mapping on the BBC website. The difficulties of retrieving debris from deep, remote oceans was highlighted by the search forÂ French Airlines flight 447. Â In this case, both black box transmitters failed. A Chinese ship detected a ping on the 5th April and a day later an Australian ship detected a ping. Â But the pings were quite far apart. Â The Australian ships detection seemed more consistent and stronger and this was backed up by more detections in the same area on the 8th. It is a slow process, but each detection should help reduce the uncertainty. Â The question is, will the batteries in the transponders last much longer? Â They are already at the limit of what is expected so time is running out. It is clear that remote sensing technology has been critical in every stage of the search for Flight 370. Â It will continue to be so until the plane is found. Â It has been used effectively to narrow search areas and discount blind alleys. It is also interesting to note how associated data has been used in ways that it was not intended to locate the plane and praise should be given to the InmarsatÂ scientists who came up with a novel solution when data and information was scarce.